Hardwood flooring is a beautiful flooring option that can last for years. If you have pets, however, you will have specific concerns that you’ll need to keep in mind before buying hardwood. Dogs and cats can scratch and dent hardwood flooring, and there really is no way to prevent all of it. The best way to drastically reduce the number of scratches and dents is to buy a hardwood flooring that has a very high Janka Rating, like hickory or Brazilian cherry, and avoid flooring with a low Janka rating, like pine or maple. A higher Janka rating means that your hardwood flooring will be less likely to scratch and dent. Finding a floor with a lot of texture or a distressed look can also help to hide the dents and dings. The other part to take into consideration is whether you are looking at solid hardwood or engineered hardwood. When you have pets, you’ll want a flooring that you can refinish multiple times when the scratches and dents become quite noticeable. For this reason, solid hardwood is best. While you can refinish engineered hardwood, there is only a limited number of times that you can refinish the veneer on top before it wears too thin. There’s no question that there will come a time when your pet will have an accident. Because wood by itself does not handle moisture or liquids well – it can expand, stain, and warp easily – the finish that is on it can help to prevent any issues in case of an accident. Prefinished hardwood that has the finish applied in factory is the best option since it is a more durable finish that will hold up better to moisture, liquids, and messes. The best way to prevent damage is to clean up as quickly and thoroughly as you can, though. 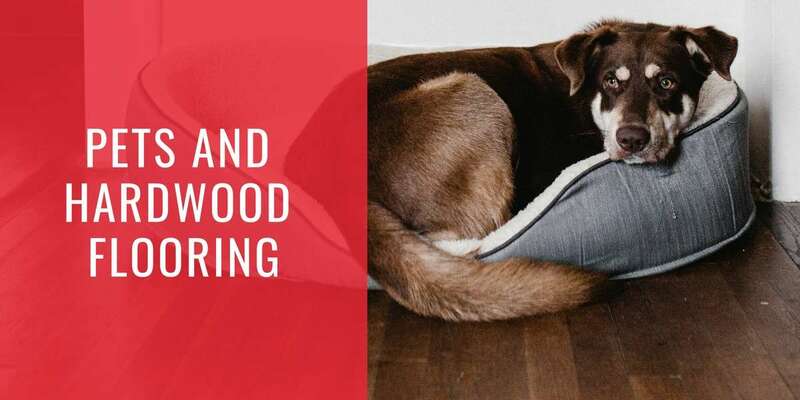 While hardwood is not the best flooring to have when you have pets, it is doable if you take the possible scratches and accidents into consideration when you go to buy your flooring.